We absolutely know we have single atom Monatomic Particles in our Colloidal Solutions. It's a bold statement to make, but we back it up with our evidence. It's rare to find a company like ours offering Pure Colloidal Gold, Silver, Iridium, Platinum, Rhodium, Ruthenium and several other metallic elements in a Monatomic High Spin State. A great deal of care and effort is expended to ensure that every bottle we produce has exceptional purity and quality of monatomic elements in distilled water. Recently, we conducted some more quality control tests. In one test, we found it to be quite challenging to convert monatomic gold back into its original state of metallic gold. Special circumstances were required for the transformation to occur. We put our Monatomic Colloidal Gold with an 18000 PPM concentration into a container and exposed it to extremely high voltages. Simultaneously, a magnetic stirrer was spinning continuously in the container. At the conclusion of the test, we saw metallic gold particles attached to the Teflon surface of the magnetic stirrer. Millions of monatomic gold particles aggregated together into polyatomic clusters which continued to grow in size even as they became visible. You may find your curiosity aroused at this point and begin to wonder, how can that possibly work? 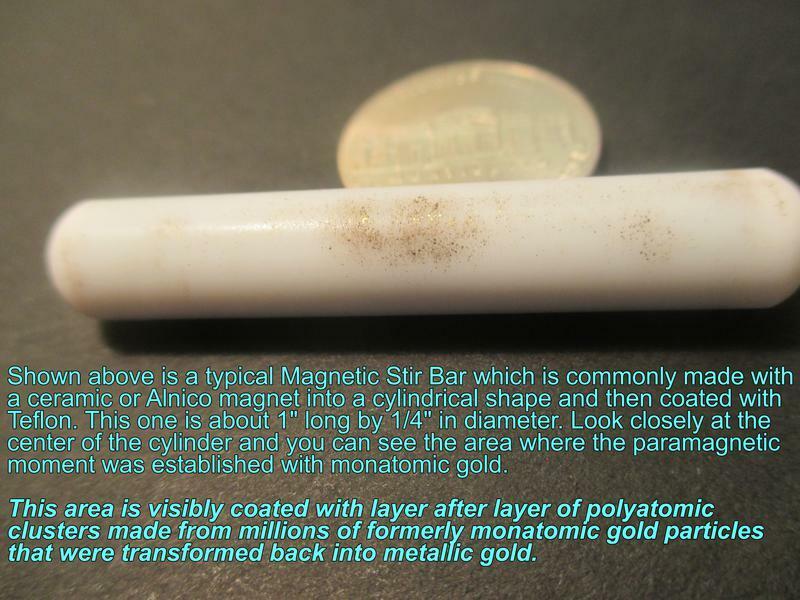 As far as you know gold is not magnetic, so why would it ever stick to a magnetic stirrer? Good question. 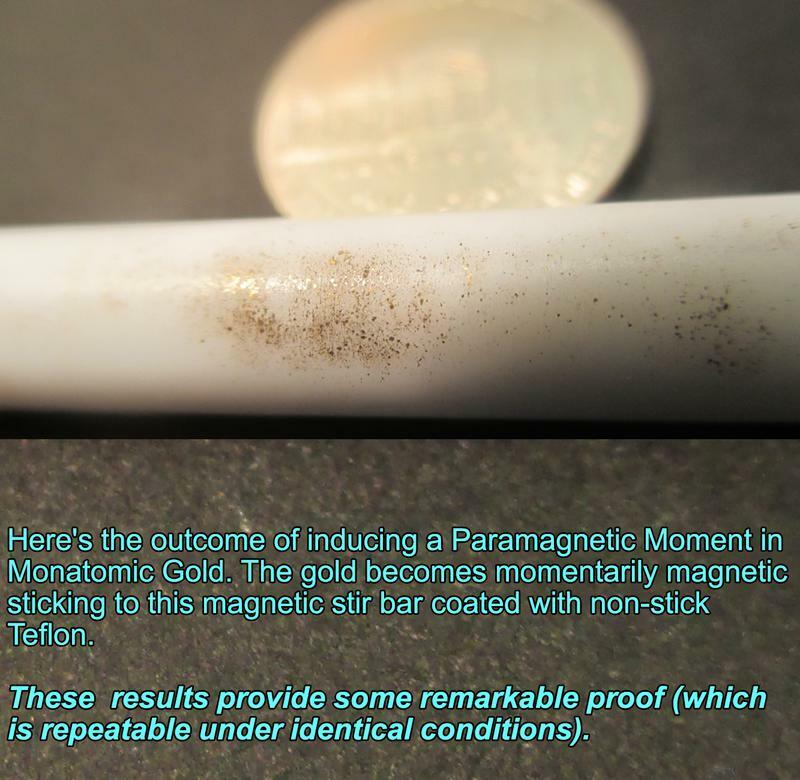 Normally, gold is not magnetic and doesn't respond to a magnetic field. However, under certain conditions, a "paramagnetic moment" can be established with gold and other elements. Once this occurs (like it did in our tests), gold then becomes temporarily magnetic and does respond to a magnetic field. Occasionally, such paramagnetic influences continue to linger long after the removal of the magnetic field. Monatomic elements have several interesting properties attributed to them. In contrast to an element that's in a conventional form, monatomic elements are much more susceptible to paramagnetic influences in their high spin state. In other words, magnetic fields can easily influence monatomic elements under the right conditions. Check out the photos below. It has been about three years since we conducted the above experiment to prove that our products are monatomic. Even though the paramagnetic moment is temporary, the gold that adhered to the magnetic stirrer is still on it; we have yet to conclude how long the "Paramagnetic Moment" will last, it could be another year it could be ten years. Find out What are the Benefits and Uses of our Monatomic Colloidal Gold Products.